Today, we welcome Tim and Lisa Trudell, of The Walking Tourists! Kearney, NE, is ground zero for one of the most beautiful scenes a person can view in their lifetime. 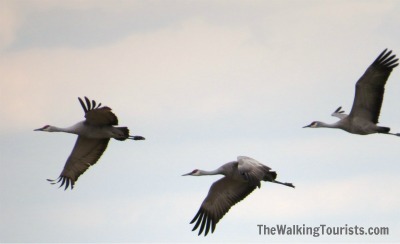 The northern migration of the Sandhill Crane is a life-altering experience. More than 500,000 cranes – about 75% of the world’s population – will visit a 75-mile stretch of the Platte River valley in central Nebraska during a 6-8 week period. This act has taken place for centuries. The Sandhill Crane is believed to be about 10 million-years-old as a species. They come to this region to rest and build their strength for the rest of their trip. They will eat vegetation and worms in area farm fields. The cranes come to the area from their winter stops – including California, Florida, Texas and Mexico. Once rested and energy restored, they will continue their northerly migrations to places in Alaska, the northern contiguous United States, Canada and Siberia. The fact that this historic migration takes place about 2 ½ hours from Omaha makes this a must-do day trip. We took our first visit to the area in the late 1990s. I’d always wanted to visit Kearney during the crane season. We finally did it. We jumped in the car early one morning and headed to central Nebraska. People come from all around the world to view the cranes. Famous people visit, as well. Famed primatologist Dr. Jane Goodall has visited numerous times. National news media outlets, including NBC and CBS, have recently visited for stories. We were so amazed at the view of these majestic creatures. An adult crane stands about 2-4 feet tall and has gray plumage. Its head has a crimson crown. They are very timid birds, so be aware of that. They will quietly and quickly move away from humans. As you drive up to view a group, they may seem close, but within seconds you realize they have moved several feet away. They are allowed to be hunted in nine of the 10 states that make up the Central Flyway. 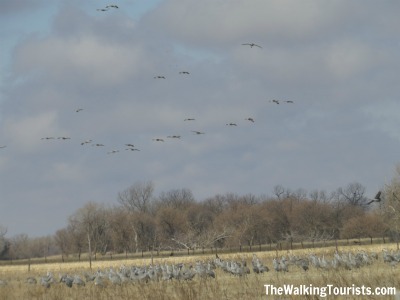 Nebraska is the only state in the region where hunting Sandhill Cranes is prohibited. You can understand why the birds are skittish of humans. A good pair of binoculars and a camera will give you a decent view of the birds. Since the Nebraska migration season is a short one – usually mid-February to the first weekend in April – you have to roll the dice with your visit. 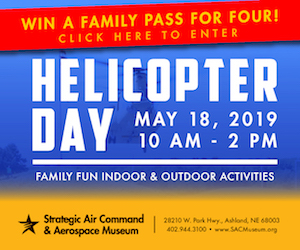 The weather may cooperate and you get a beautiful, sunny and warm day to visit. Ok, I tried to type that with a straight face. Due to the time of the year, it could be chilly and gray. But, we’ve also had our fair share of beautiful weather. During our recent visit, there were a reported 180,000 in the area. You will see the birds in different sized groups. There may be a large group eating and flying together; or, you may see a smaller group. You may even see a couple or family by themselves. Cranes mate for life, so it’s common to see groups of 2-4 eating. It’s likely the parents and children. Rowe Sanctuary (www.rowe.audubon.org) is a great place to visit. The staff can answer questions and provide advice on crane watching. Do not approach cranes on foot while they are in fields. Cranes do not tolerate humans. Stay in your car and use it as a blind. Use appropriate locations for viewing the cranes on the river. Do not attempt to approach or otherwise disturb cranes on the river. Never approach a whooping crane. Flushing a whooping crane violates the Endangered Species Act. Stay in your car. View guidelines to avoid harassing whooping cranes. Do not slow or stop on the road. Drive onto the shoulder. Never slow down or stop on bridges. Never block a driveway or any other farm road. Stay on county roads. Do not drive on farm roads. Assume all property is private and obtain owner permission before entering. Never cross a fence or open a cattle gate without the owner’s permission. Do not disturb farm animals, cross cropland or touch farm equipment. Respect the rights of the people who live in the area. Rowe offers crane viewing tours. You can reserve a spot in a riverside blind for evening viewing as the cranes come in for the night. It’s a reasonable fee and you can learn more about it on their website. We took the tour a couple of years ago. It was fascinating! We followed a guide out to a set of concrete blinds where we were able to watch the cranes fly in for the night. Dress warm – layers. Don’t forget the gloves at home (like this writer). 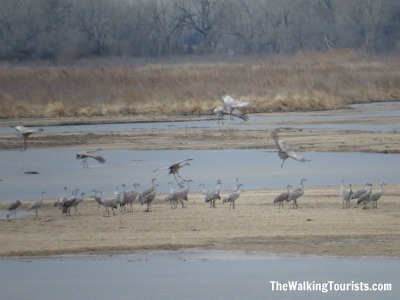 Cranes spend the night on sandbars in the Platte River and surrounding area tributaries. This is actually for their protection. Predators – coyotes, foxes, etc. – will wade through the water to get to the birds. The four-legged creatures splash water, and the noise alerts the birds. They’ll fly away for safety. As you stand in the blind, you see them land. One bird may land on a sand bar. Then another. Before you know it, hundreds of cranes are on a sand bar. They’ll repeat this until all the birds are in for the night. Watching them come in for the night is a major reason to visit the area. They are almost synchronized on what time to head in for nesting, following a day of eating in area farm fields. Around sunset, the sky will fill with thousands of birds flying and sounding off. The crane’s sound is unique. It’s a bugle sound, according to www.allaboutbirds.org. They last about two seconds and can be strung together. A crane call can be heard up to 2.5 miles away. 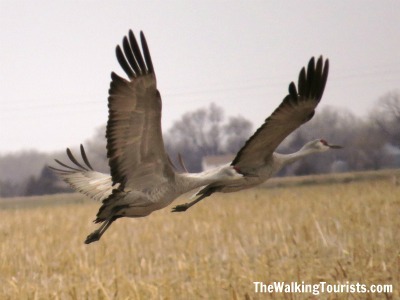 The Crane Trust near Wood River, NE, also offers crane viewing. The center is just off Interstate 80 at Exit 305. For more information, please visit its website at www.naturenebraska.org. However, you don’t have to pay to see the cranes fly in for the night. 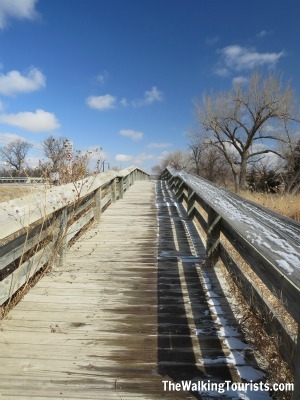 There is an observation deck along the Platte River, just a few miles south of the Gibbon exit. Hundreds of people will fill the area about an hour before sunset, prepping for the evening descent. Watching the birds fly overhead is a great sight to take in. They are graceful in the sky. Thousands of them will fly in as you watch from the deck. If the sky is clear, you can see dark spots miles upriver in the hue of the sunset. It’s a special feeling. Last year, our daughter’s best friend took in the trip for the first time. She left amazed at the experience. This year, we ran into the cold and gray that comes with late winter and early spring. The only thing that was truly affected was the evening viewing. We still saw the birds fly in. But, we didn’t have the color that comes with the sunset. It was a cold, snowy evening. So, that kept some people from the viewing stand. We still had a decent turnout – maybe 40-50 people. Doing a “Crane Watch” is a great way to spend a day. You just have to realize that it will be a long day trip. But, it is so worth it. 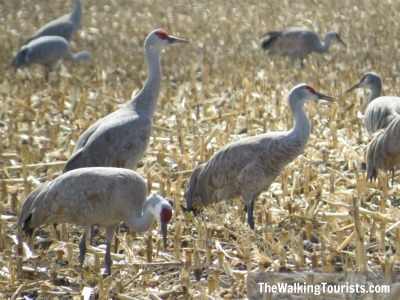 Once you see the thousands of Sandhill Cranes, you will fall in love with the experience and want to make the trip west again. 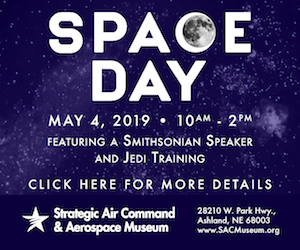 Plan accordingly when you go. Bring coats, jackets, gloves and hats. Also, plan your meals accordingly. There are restaurants in the area, but you will need to go into Kearney or Grand Island. Bringing meals may be an idea. If you decide to spend the night, the area has a lot of nice hotels. We usually do a day trip, but have made the trip an overnight one. 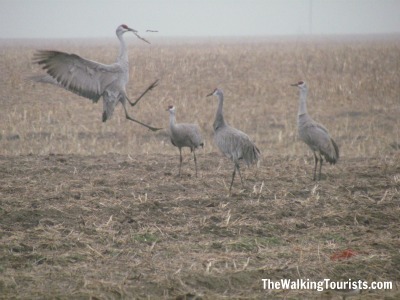 Regardless, a day trip to central Nebraska for crane viewing can be a life change. Enjoy your visit. We love traveling – locally, regionally, nationally and internationally (not as often as we would like). We originally started The Walking Tourist to share our experiences with friends and family. 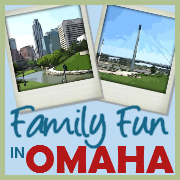 Whether it’s across the world or in our own backyard in Omaha, Nebraska, we love to explore the sites and experiences all around us. Check out more of Lisa and Tim’s travels at The Walking Tourists!